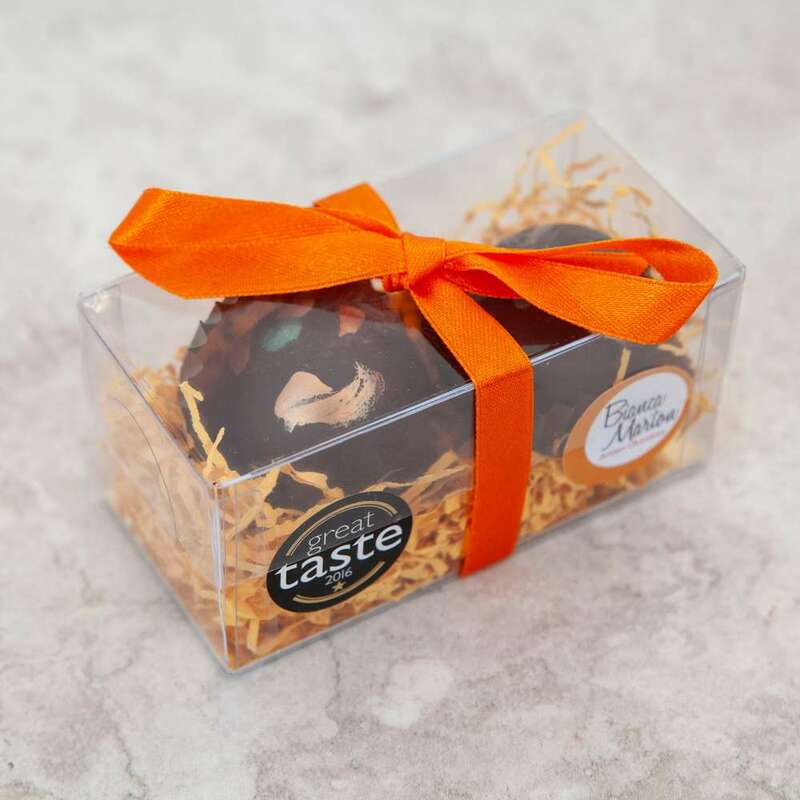 Fruit Cake Balls - Our Great Taste Award Winning take on the traditional fruit Cake.We offer a modern take on the traditional fruit cake, that is soft, light and boozy, oozing with the traditional flavours, yet light and fruity.Our not-so well kept secret are raisins, dates, and orange peel that are soaked and ripened in flavoursome Hungarian plum schnapps for months, which are then added to dark muscovado sugar, flour and spices. 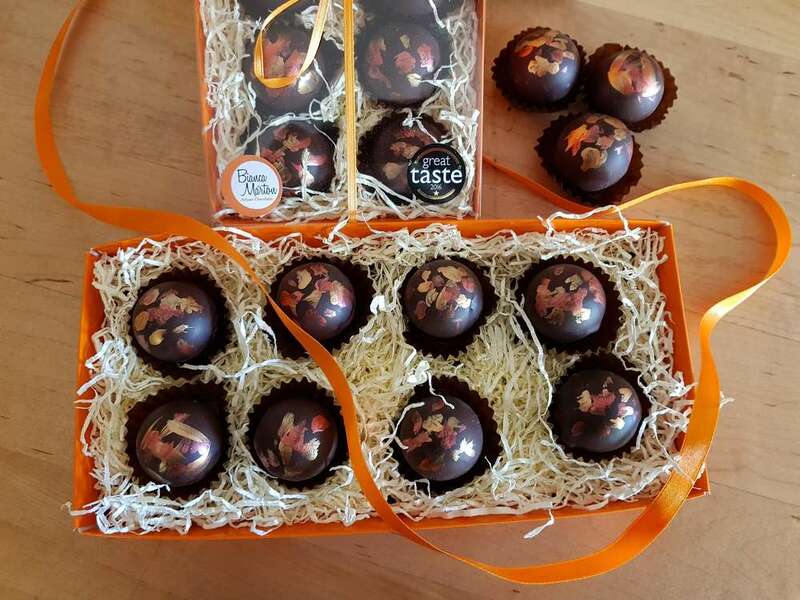 Instead of sugar we seal them in a lovely dark chocolate shell.Each box contains 8 individually finished and hand-decorated balls. Each ball weighs min. 30g. Dairy and egg free, ideal gift for everyone, including Vegans.Add a gift message:Use the "Message" section below to add your personal message. We will print this on our complimentary card, and include it with your gift free of charge.Alternatively you may choose to buy one of the lovely artisan cards we offer: Buy an Artisan Card. If you do so we will print your message using the card you purchase, and include it with your gift. Discover the delicious and complex world of dark chocolates with this carefully chosen dark chocolate selection. 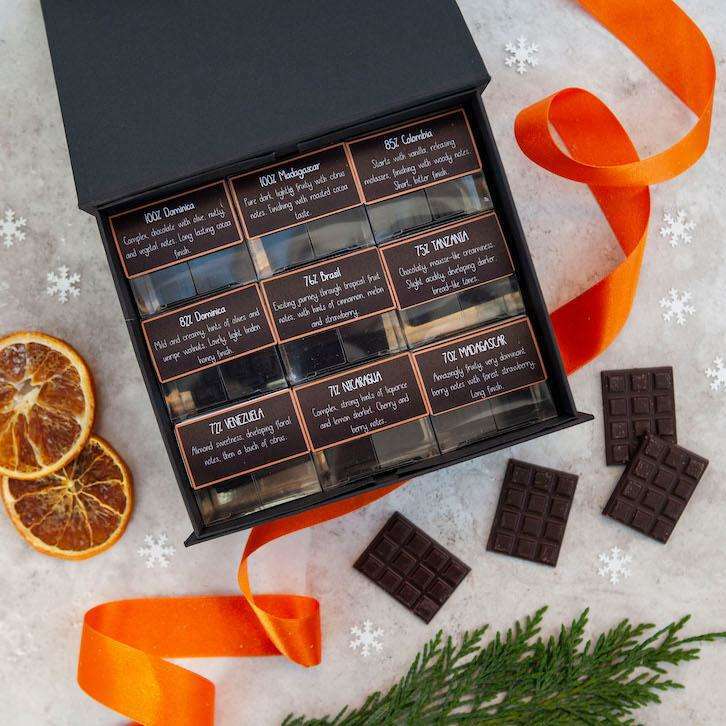 Your tasting box contains tasters of 9 different kinds of chocolates from different growing regions, they also represent different strengths (% cacao content) from 100 to 70%:Madagascar, 100%Dominica, 100%Colombia, 85%Dominica, 82%Brasil, 76%Tanzania, 75%Venezuela, 72%Nicaragua, 71%Madagascar, 70%The box includes a guide to chocolate tasting, and description of the chocolates included in your gift box. Fun, delicious, informative. Great to share with your family and friends. 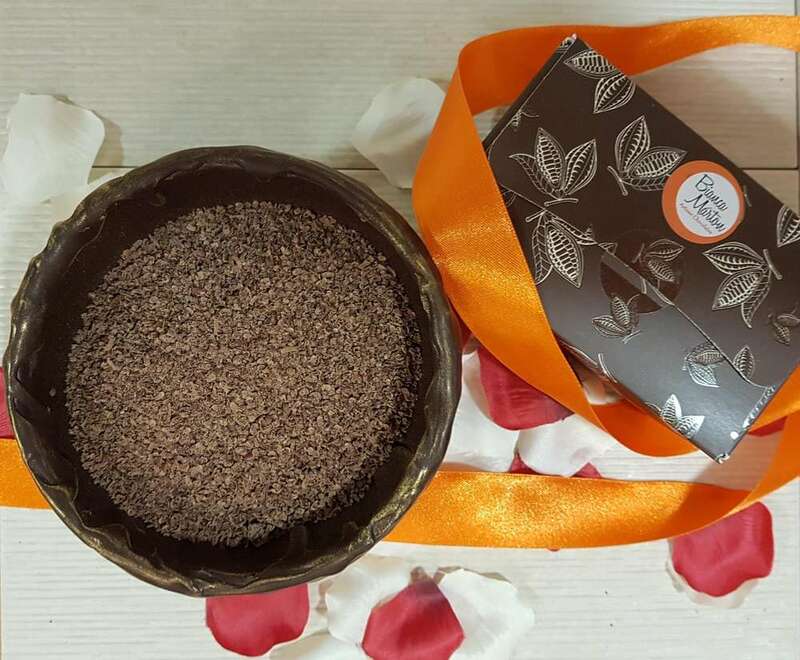 All chocolates are dairy free and suitable for Vegans.Ingredients: Cocoa mass, cocoa butter, cane sugar. Colombia and Venezuela chocolates contain soya lecithin. These unpitted medjool dates are deliciously fleshy, they burst with sweet flavours reminiscent of toffee and caramel. This sweetness is beautifully balanced with the 75% dark chocolate cover. 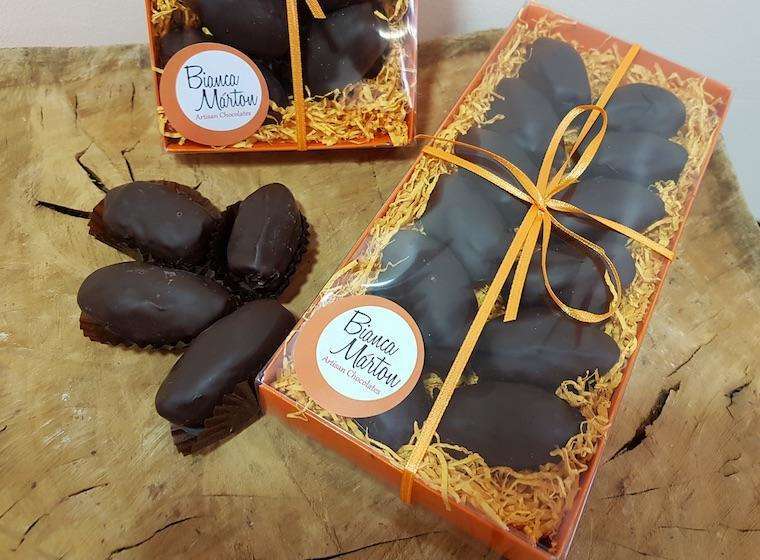 Beautifully packaged, they make a wonderful gift as well.Pack contains 12 dipped dates.Vegan, dairy free Add a gift message:Use the "Message" section below to add your personal message. We will print this on our complimentary card, and include it with your gift free of charge.Alternatively you may choose to buy one of the lovely artisan cards we offer: Buy an Artisan Card. If you do so we will print your message using the card you purchase, and include it with your gift. 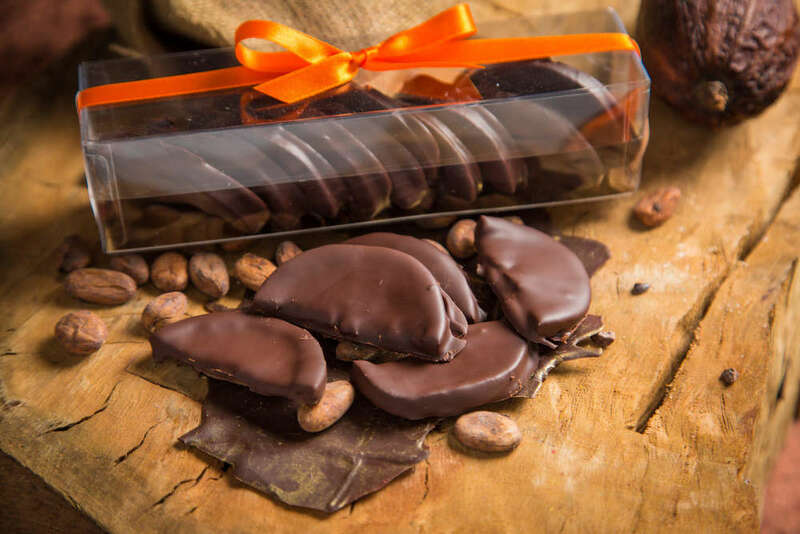 Candied orange slices covered with 75% single origin dark chocolate, that comlement the juicy, bitter sweet flavour of the oranges.A real treat for the autumn and the coming festive season.Each slice is and carefully hand dipped in our own workshop, and packed for a generous, sharing portion.Vegan, dairy free. Add a gift message:Use the "Message" section below to add your personal message. We will print this on our complimentary card, and include it with your gift free of charge.Alternatively you may choose to buy one of the lovely artisan cards we offer: Buy an Artisan Card. If you do so we will print your message using the card you purchase, and include it with your gift. A beautiful handmade chocolate cup, and a bag of excellent hot chocolate.The chocolate cups are made from 75% single origin Tanzanian dark chocolate, and the hot chocolate is of pure 66% strength dark chocolate.The hot chocolate comes with cooking instructions, which enable you to make the most delicious, thick and creamy chocolate drink that you ever tried. If you are up for some fun, you may pour your hot chocolate into your chocolate cup, enjoy to watch as it melts, and eat the pieces with your drink.Dairy free and suitable for vegans.